This dartboard hung in the upper Burpee studios in 1969 or 1970. Note the box in the upper right awarding 137 points for the "cruddy RCA cart machine". The RCA machine was replaced in the Fall of 1970 by three cart machines donated by WROK. The RCA machine was retired. "TMV" on the upper left is "The Morning Vegetable" (James Landis Buchman). 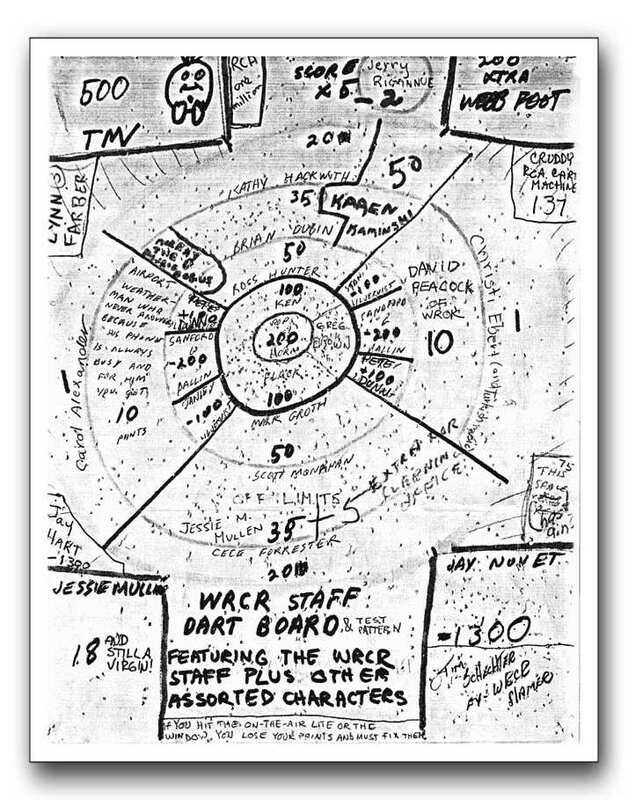 "Webb Foot" on the upper right is probably Webb Kerns a founder of WRCR, but in 1969 he was a college admissions officer and frequent visitor to the station. Cece Forrester still has the original dartboard and brought it to the 2005 reunion.